Last Saturday I wore my white jodphurs and rode down a center line again for the first time in about 8 years (except for a one-off outing after about 2 years ago!). 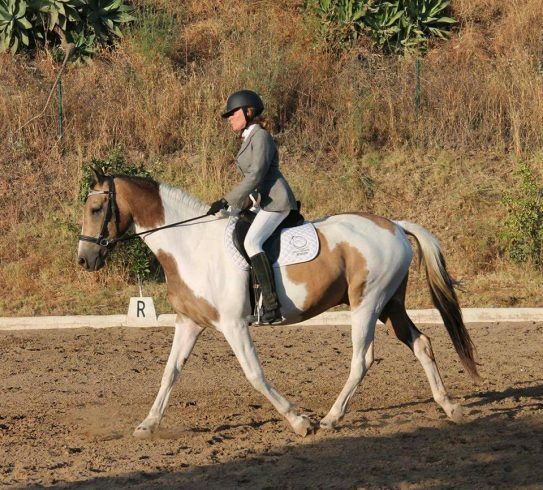 I was motivated to attend the local dressage friendly competition because it is important to me that I support the community of riding centers that are local to me here in Spain. Plus, this particular event was running on a 60m arena, and that was soooo tempting! For many years I dreamed about going down an Olympic Center Line. Everything I did around my horses was driven by that goal. Then, 8 years ago, I discovered something that brought that dream to a sudden awakening and I haven’t had that dream since. What I discovered was that my dream was driven by ‘my need’ to prove something. To be recognized, to be“the best”, to win, to be better than others and to be applauded. All ego driven motives. When I made that discovery, I also realized that, as much as I said I loved the horses in my life (all horses, really! ), I wasn’t really honoring ‘their’ needs. I expected them to perform as I requested, when I requested and because I requested. Full stop. Since I stopped competing, I have been studying, reading, observing, pondering, learning and sharing about doing things around horses in a way the gives them a say, too. Somehow, that idea of giving a horse a voice just didn’t fit with competing. So I didn’t and haven’t, until last Saturday. When I think back, the exception last time (about 2 years ago), was a bit “ego heavy”, too. I made a big stink about not wearing a cavesson (sorry Mrs. Show Secretary) but rode in a bitted bridle! This meant I had to compete H.C. (in horsey jargon: non competitive, out of the final standings). I hate to have to admit that I was a bit arrogant about it all and was very aware of what the people there were thinking. I was trying to make a statement. Saturday I went because I wanted to show support to our local riding movement. The horses and riders that I usually coach weren’t going, so I decided with about 48 hours notice that I would go and show willing. Talk about preparation! I sent in my entry : “Class 2: Prelim A: Monica with “something”, whatever is happy to load tomorrow!” And that, truly, was my intention! As long as the horse was happy to load, I was happy to take him to the show. I entered HC again (non competive), but this time because I really had not done enough preparation with any of the horses to expect them to complete a full test. My plan was to show up and ride down the center line, then see how far my horse was happy to go. I was ready to retire as soon as I felt I was ‘making’ my horse do anything. Outlines, short reins, engagement, canter…. even the halt at X….. all of that went out the window! I started to ride the test and just kept asking Claude: Can we do a little more? Still more? Wow, more? Before I realized, my center line and my planned early withdrawal turned into riding a full test. I felt Claude was willing, curious, wiggly, maybe a bit unbalanced, trying hard, perhaps a bit strung out, playful, present, bouncy…with me. It was just so fabulous. I really could not have cared less about what the judge, or any of the people watching, had to say – and I don’t mean that in a rude way. Just that today, whatever Claude had to say was waaaaay more important. And that was so incredibly liberating. I can’t wait to do it again! Maybe it is possible to ‘compete’ leaving Ego at home? I’ll keep you posted. In my next blog I will share some technics that I used in my warmup session that turned my upside down, head bobbing, un prepared ‘dressage mount’ into a placid, cooperative partner in about 20 minutes flat! 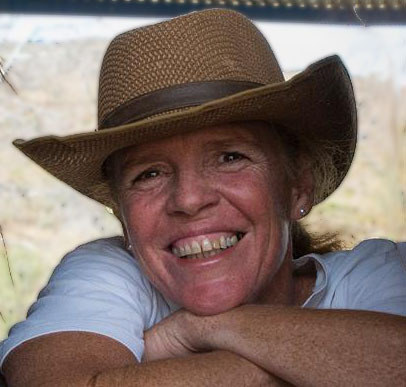 Monica's passion is sharing the joy of horses and helping people create softer, calmer, more willing and connected partnerships with these amazing creatures. She lives with her partner Ian on beautiful Finca Las Posadas, nestled in the mountains of Andalucía, Spain where she holds live workshops, clinics and retreats.